In the 1860s simple taxes on such instruments as receipts were introduced and initially Indian 1a. 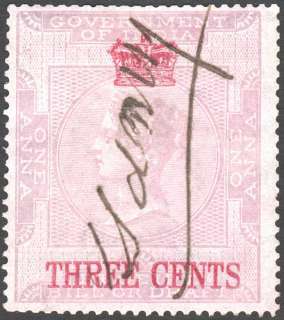 stamps overprinted with ‘SS’ in a diamond were used. In time a universal receipt stamp become imperative and naturally Government of India 1 anna receipt stamps were sent. On 17 April 1867 the administration of the Straits Settlements was transferred from the East India Company in Bengal to Penang and ten years later to Singapore and the receipt stamps were over- printed with the Crown and a new value, 3 cents. Postage stamps of the period were also overprinted with the Crown and new values in cents. 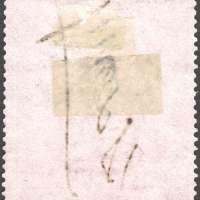 The first Straits receipt stamps were issued on 27 November 1874 and were similar in size to the Indian ones and printed by the same printer, De La Rue and Co Ltd, in a similar singly fugitive ink.